Cauliflower mashed potatoes are a terrific alternative to ordinary mashed potatoes. Cauliflower replaces some of the potatoes, giving the dish the same consistency, flavor, and texture as regular mashed potatoes but with fewer calories. One cup of cooked potatoes contains about 135 calories, while a cup of cooked cauliflower contains only around 25 calories. As long as you watch how much milk or butter you add, you can save some major calories. 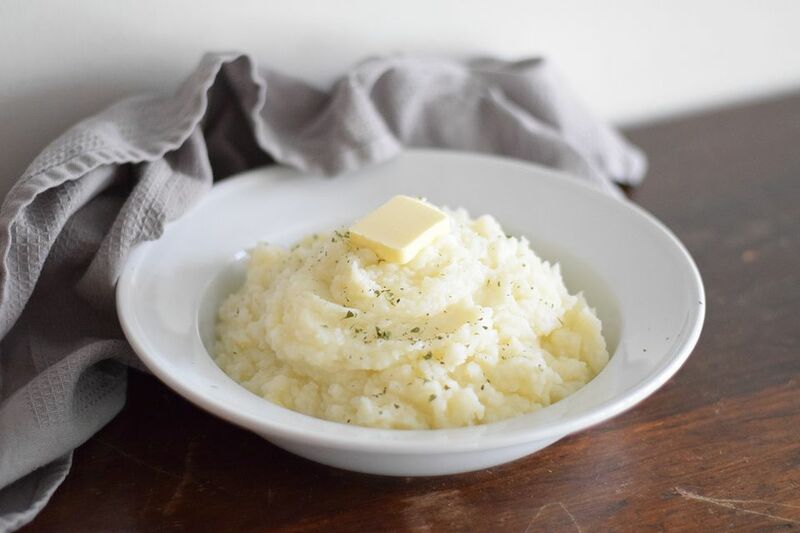 To make these easy cauliflower mashed potatoes, you will first gather together the ingredients, including russet potatoes, cauliflower florets, buttermilk, salt, and pepper and a cauliflower mashed potatoes recipe. You will need pots for boiling and steaming, a blender or immersion blender, and a hand mixer. You will cook both the cauliflower and potatoes. They require different cooking times, so it is a little tricky to cook them in the same pot at the same time. Cook them separately for the best texture. You can steam the cauliflower as opposed to boiling it, which keeps the cauliflower from becoming watered-down. However, if you would prefer to save yourself from washing an extra pot, you could begin cooking the potatoes in a large pot, and add the cauliflower about five minutes later, and finish cooking the potatoes and cauliflower at the same time. Follow these steps to cook the potatoes and cauliflower separately. In a larger pot of water, place the potatoes and bring them to a boil over high heat. Reduce the heat to medium-high. Cover the pot with a lid and simmer for 10 minutes, or until fork-tender. Drain in a colander, and set aside. While the potatoes are cooking, fill another large pot with about 2 inches of water. Add the cauliflower and place the pot over medium-high heat until the water simmers and produces steam. Cover the pot and steam the cauliflower for about five minutes until tender. Keep an eye on the water level during this step. Be sure to add a little extra water if needed as you do not want the bottom of the pot to become dry. Drain the cauliflower. 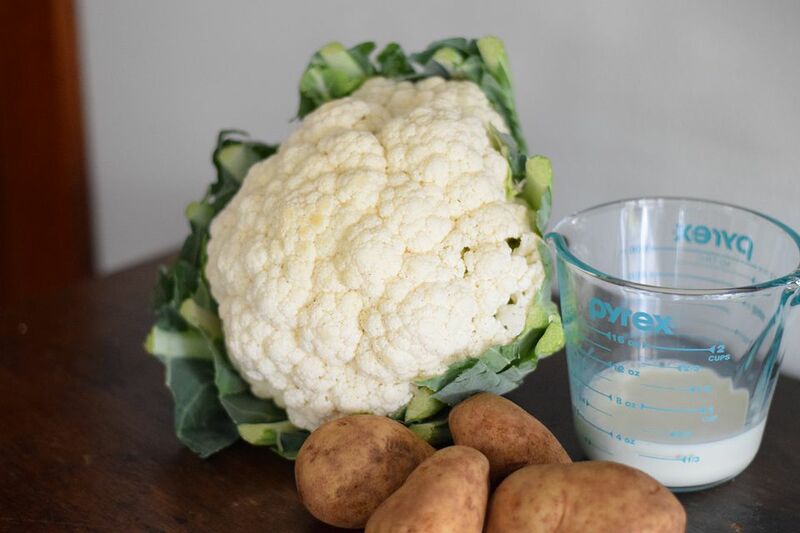 An alternative method to steam the cauliflower is to do so in the microwave in a microwave-safe steamer or bowl with a little water, microwaving on high for about five minutes. Next, you will blend the cauliflower to make a cauliflower puree. The processed cauliflower will make for nice and creamy mashed potatoes. You will need the steamed cauliflower and about 1/4 cup buttermilk. You can use a blender or an immersion blender. The buttermilk and blend on high until the mixture is relatively smooth. Some small chunks are OK.
Place the cooked potatoes in a large mixing bowl. Add about 1/4 cup of buttermilk and use a hand mixer on medium speed to mix the potatoes and milk for about 30 seconds. Add the cauliflower puree, salt, and pepper. Mix on medium speed again until the potatoes are well mixed and are smooth and creamy. Serve the cauliflower mashed potatoes as you would any other mashed potatoes, and be amazed at how unlike cauliflower they taste. They contain about one-third fewer calories than ordinary mashed potatoes.